Maretron's DCR100 contains 6 Direct Current (DC) relays, each capable of switching up to 10 amps. 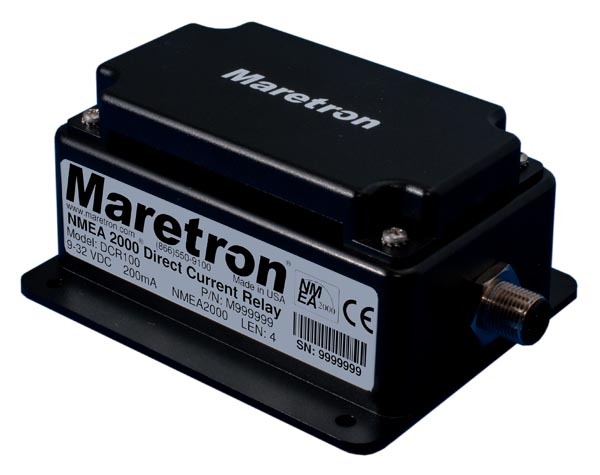 The DCR100 connects directly to an NMEA 2000® network and the associated loads can be switched while onboard using Maretron’s dedicated NMEA 2000® displays (DSM250 or DSM410) or Maretron’s N2KView® or N2KView Mobile software. Loads can also be switched remotely using Maretron’s Real Time Cloud Service. The DCR100 easily handles resistive DC loads like lights, or inductive DC loads like pumps and motors. The DCR100 can also be used to switch AC circuits using external relays. Channels can be assigned as annunciators for using external lights, horns etc. when an alert is triggered. Connect external lights and horns for alerts.